This article is fully dedicated to the “country of origin”-theme. It contains everything you should probably know on that matter. This is going to be mainly a brief introduction because of two reasons. The first reason is I that I am not a native English speaking person. The second is, if the articles are too long I am worried that less people will read. Ill try to keep it as short as possible but will give of course a deeper look inside the COO theme, because this is what this thread is mainly about. If you have further questions feel free to contact me. The following is now important for understanding when a coo is placed. 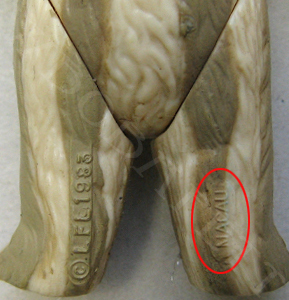 The first figures produced in that mold is the so called „first shot“. These normally don’t have any markings! The awarding authority (Kenner) has a look at this „first shot“ and gives its okay for the production. At this point the molds first gets duplicated and then stamped and marked! I have no proof of the following but to me it makes totally sense: The steel-molds were the original ones, the ones the first shots were made from. These were duplicated in steel, aluminium or brass. Aluminium and brass are more easy to work with because they are much „softer“ then steel. Especially for the limbs (very soft plastic, less wear) no steel molds were necessary. In aluminium or also brass it would be possible to stamp the coos in with a lettering system similar to old printing systems. You have all letters made in steel which can be set together in the way you want them and get „hammered“ into the molds. Therefore you would need softer materials then steel and it would explain many nearly similar COO’s which just one letter out of line next to one where all letters are in line or another letter which is out of line. The copyright starts with the typical symbol for it the „c“ with circle around it: ©. On the vintage figures it is then followed by three different abbreviations: G.M.F.G.I (General Mills Fun Group Inc.), C.P.G. (Consumer Product Group) and L.F.L. (Lucas Film Limited). The year is normally directly placed behind the copyright. In this case the year indicates when the copyright was acquired for the character. Its often said the figure was produced in this year, which, put simply, is wrong, because they didn’t changed the molds every following year while producing. 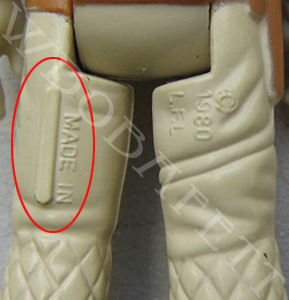 It also explains why the R2 with pop-up saber is marked with 1977, although he was produced not before 1985. But for sure the year indicates also the time frame beginning with the production of a character (in his original form), because that simply goes together with acquiring the copyright. The country marks indicate where the figure was produced. Which means where the plastic was injected into the „steel-molds“. This doesn’t indicate where it was assembled, painted or packed, which can differ from the country mark. Stamped „Made in Hong Kong“, „Hong Kong“ or „H.K.“. These are normally the unaltered „steel molds’, so I call them „original COO’s“. Stamped „Made in Taiwan“ or „Taiwan“. These are unaltered coos and also belong to the „original COO’s. Stamped „Macau“, „Macao“ or the country is deleted (no COO). These are altered Hong Kong COO’s. 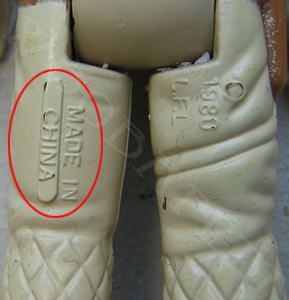 Stamped „Made in China“ or „China“ always on a raised bar. Also the blank raised bars and other no coos can be China produced figures. These are all altered Hong Kong COO’s. The figures I’m talking about are: Klaatu, Squid Head, Biker Scout, Gam Guard, Nien Nunb, Chief Chirpa, Logray, Lando Skiff, Ree Yees, Vader and Yoda. (Although some of these appeared in Spain with the same COO, but IMO these were bought in Mexico and just packed in Spain). Regarding these figures all have one thing in common: They all appeared also on MIM (Made in Mexico) cards in the USA. Given that these molds were not altered and the fact that new „steel-molds“ are very expensive it totally makes sense that exactly these figures were produced for more than just the Mexican market. And even more it is assumed that Paploo and Lumat were only produced in Mexico for the worldwide market which also appeared on MIM cards. So you can see the situation in South America is very complicated, but this is nothing when compared to what happened in Europe. – and finally bought finished figures from Mexico (ROTJ) and Taiwan (ESB, ROTJ) to pack them. I’ll have to add some points to the so called „scarred out coo“. This is the only one which is roughly done and with lots of additional material (Tin-lead mixture?) on top of the former COO. That’s the reason why the look of these can change while producing them in high numbers. 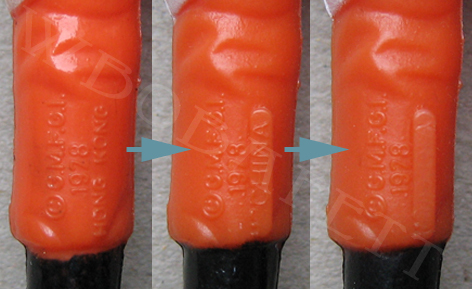 The fact is that these „fill-ups“ can change or become damaged, fully or partially because of wear on the molds. A famous example is the half scarred Snaggletooth. 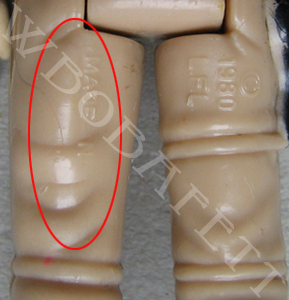 To me it‘s clear that half of the „scar“ broke off while producing full scarred figures. Lots of them where produced and this mistake wasn’t fixed or was changed very late (Perhaps it was simply not noticed in a busy factory). That’s why there are quite a few of them existing. In case of the Lando Bespin scars it is difficult to be sure what happened exactly. There are lots of different scars known, on some scars even single letters can be seen (again?). 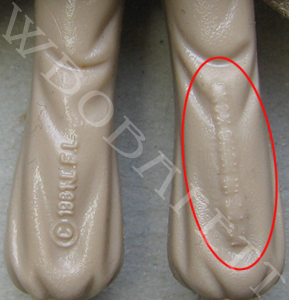 The fact is the Lando is one of the more common scarred figures and also there was not only one mold to produce him. 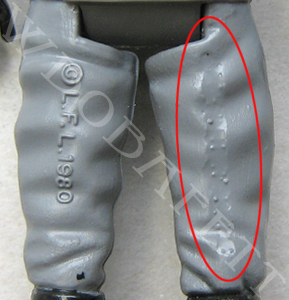 However, regarding other scarred out figures we can assume that there was 2-4 different scarred out molds (in most cases 2 different scars are known on Greedo, ATAT Commander, Biker Scout, etc.). But there is a real large number of Lando scars existing. Well, the only way to explain this is that the „fill-ups“ often broke out and in this case often were repaired or the fill-ups were renewed. Its of course just a theory but I think it makes the most sense. There is another curious scarred out COO which I like to mention. The only known scarred out COO where a country mark was stamped on top of the scar is the famous Macao Biker Scout. Not only is this unique in the world of COO’s but even better, PBP altered it again and removed the „Macao“, you can say „scarred out the scar“. Another aspect from the COO-Family is: Same mold but slightly different COO. Regarding the LXW again there can be two slightly different HK COO’s found. These 2 molds always traveled together and also were altered together. On this character we have 2 “COO-Families”. Some characters have more, some less. Most families have 2 different coos which traveled together and where altered together. This is really quite a guess, but I assume most „steel-molds“ were produced as pairs. If a second pair was needed, new „steel-molds“ were made. Of course the ones that were already in production couldn’t be duplicated without stopping production. This is the reason in my opinion why every new „steel-mold“ made, has a slight different mold. Some of these changes may be modifications, others like slightly different folds in the cloth-mold were simply not intentional. There are some mythical COO’s that have only appeared once. COO collectors all over the world tried to track these down with no luck in achieving one. After years these examples are still the only known and no second example has been found so we can be pretty sure that these are just production errors. On the other hand there are 2 or 3 COO’s which seem to be legit (no factory error possible because of the form) and they are still one of a kind. I will add these in my guide although I normally wouldn’t do because one example that I didnt even hold in my hands is for real no proof of legitimacy. I of course will mention this in the guide. You will notice that some COO’s that appeared on the old guide on RS, have been removed. This is because I am pretty sure that they are not legitimate COO variations. And if it wasn’t already complicated enough by now a new problem hits the market. Unfortunately when certain areas of collecting become popular, people soon realise that certain „rare“ COO variations can be sold for a lot of money to unsuspecting collectors. Scammer’s with a little exercise and more experience could perfect this method of altering COO’s and fakes could become a problem in the future, so please be careful. HUGE THANKS to Joe_O. He helped me in more then one session to get the text into a proper english. Thanks mate…big kudos!! Thanks for the article. I’ve always known that the markings on the figures held some sort of meaning, but I didn’t understand until now that there were so many variations on them! I will have to go through my collection that I’ve had since a child and see what’s in there! Thanks for your useful site and for sharing your knowledge with other collectors.Your COO guide is brilliant.And your sceptical view on the poch/PBP hype should help people to calm down.I am not collecting every variant of every figure but over the years my loose collection has grown up around 450.Now I am able to identify some of them which were a mystery for me.Thanks for that.Sorry for my bad english! 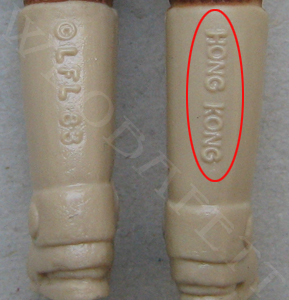 I have a figure the dengar with the 2 marks (c 1980l.f.l and Hong Kong ) o let leg, and not guide. The country please? Pingback: Question about loose fake figure. are they out there? How about this. 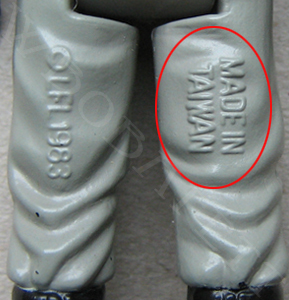 A figure with Double COO’s what i mean is “made in Hong Kong” is stamped on the back of each leg of vintage Bespin Han figure. Has anyone seen or heard of this? Is it rare? If so does it have a higher value? 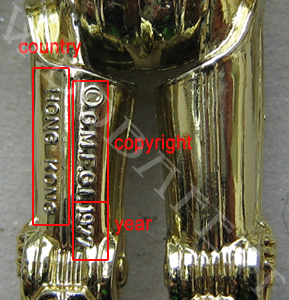 The figure came with either the Hong Kong stamp on the right or on the left leg. Your figure could be a factory error, IE wrong legs grabbed from parts bin or left over legs being used. 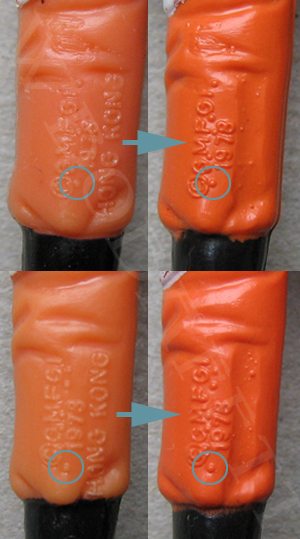 Someone may have also swapped legs between two figures to make it look like an error or to fix a broken figure for customizing etc..The Imperial gunnery guide show the figure with the two different legs stamp for the hong kong Solo. I’ve recently received a Greedo with no markings whatsoever. Completely smooth leg, and I couldn’t see any remnants of markings under a magnifier. It has lighter blue paint and a darker, almost iridescent head. (assuming degradation on the head). Compared to all of the other Greedo’s I have, it is the same weight and size.. both legs are same length, etc. However, the details in the body lack a certain crispness, and the foot on the COO leg is very slightly smaller the other. I assume that it is a short pour situation or a similar factory error. Is that fairly common? I have 2 1980 Hong Kong made Bossk Figures and 1 has more paint added to his feet that go onto the bottom of his paints. I have looked and looked and haven’t seen one at all. I was wondering if this is just overspray or what? They have a cool name and all, what do you guys think ? Hi, i would be greatful if anyone could tell me if there is any significance with a figure which has a large C stamped on leg. I know the C stands for copyright. Most of my figures have a small c stamped , but only a few have a large C. Are these more rear and if so carry more value? Would appreciate if someone could shed some light on this for me.